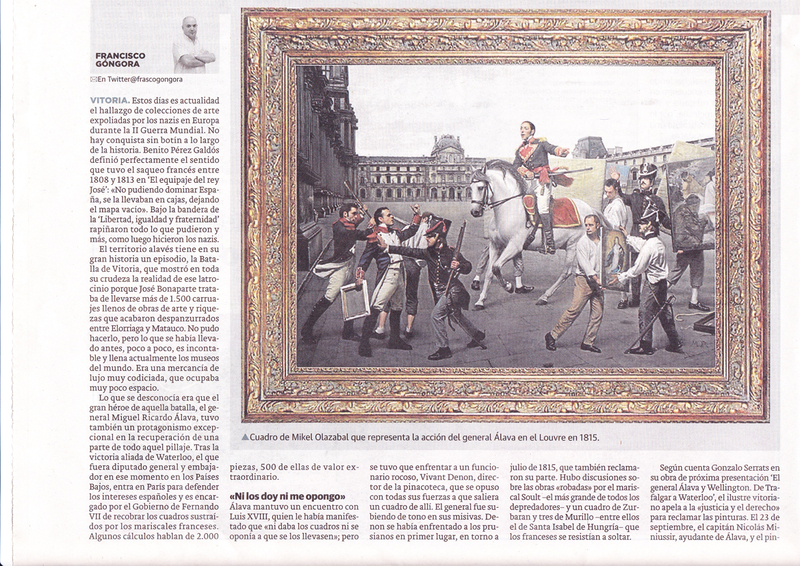 The Article talks about how Miguel Ricardo de Alava y Esquivel, from the city of Vitoria, in Spain, got a little rough and in the year of 1815 he decided to rescue the spanish paintings that the French had looted during the Napoleonic wars. This all happened in the Louvre, Paris, where the french had gathered all sort of looted stuff from all over Europe. The most interesting part is that this paintings, once back in Spain, became the base for the actual Museums like el Prado and the Academia of San Fernando in Madrid. Not many people know that. We enjoy the art in there, but very rarely know about how, why or who made it possible. There is also a brief explanation of the planing for commemorating the event in Vitoria and in Madrid too. ( If you wish to read the original article in spanish, you could do so in the “Links” section “artículo en el Correo 2015”.